Regularly a starter, Terry Doyle piggybacked Morales and did not take to the new role. Doyle had allowed two or fewer runs in six of his seven starts, but gave up five in only one inning of work against Charlotte, allowing five hits, a walk, and a hit by pitch. Doyle took the loss, falling to 3-3 on the season. A pair of relievers continued to impress. Ryan Rowland-Smith (pictured) fired three hitless innings. The only baserunner he allowed came on a walk, and he struck out three, lowering his ERA to a mircroscopic 0.40. The only pitcher in the system with a lower ERA followed, as Chris Martin made his Pawtucket debut. Martin was promoted to the PawSox after beginning the season with 21 consecutive shutout innings at Double-A. His streak continued, as Martin tossed a scoreless eighth, giving up one hit. It was a tough night for the bats against Stewart and the Charlotte bullpen. After a Bryce Brentz single scored Jose Iglesias in the first inning, Pawtucket did not have a player even reach third base the rest of the evening. Brentz had the only multi-hit night, going 2 for 4. Mark Hamilton saw his hitting streak end at seven games, but extended his on-base streak to 11 with a walk. Salem never led in its 8-3 loss, as the Myrtle Beach Pelicans (TEX) completed the four-game sweep. It was the sixth consecutive defeat for Salem. Keury De La Cruz was the only batter to reach base twice, going 1 for 3 with a run scored and a walk. Garin Cecchini went 1 for 4, notching his Carolina League-leading 13th double. Brandon Jacobs also went 1 for 4 with a double. Starter Mike McCarthy was hit hard, allowing seven runs (six earned) on nine hits in four innings. The outing saw McCarthy's ERA leap from 3.49 to 4.73. Matthew Price struck out a pair in two perfect innings of relief, and Chris Balcom-Miller allowed just one unearned run on two hits in his two frames. The Greenville Drive were on the wrong end of a pitchers duel, falling 1-0 to the Asheville Tourists (COL). A masterful pitching performance by Rockies 2012 first rounder Eddie Butler had Greenville reeling, and the Drive were able to muster only two hits on the evening. One of those hits came from Mookie Betts, who has now hit safely in nine straight, and reached base in 11 in a row. During the hitting streak, Betts' batting average has jumped 84 points, from .145 to .229. He also stole his seventh base of the season. It was a strong performance in a losing effort by the pitching tandem of Cody Kukuk and Jason Garcia. The only blemish was an unearned run in the second inning allowed by Kukuk. Overall, the big lefty allowed four hits in four innings, while striking out and walking three apiece. Garcia gave up only one hit in his four innings of relief. He struck out three and walked only one. 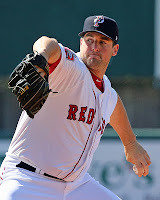 Player of the Day: Ryan Rowland-Smith was nearly perfect in relief for the PawSox. The Aussie left-hander saw his scoreless streak end last Thursday when he allowed an unearned run, but he has not given up an earned run since opening day, a stretch that has now reached 21 innings.